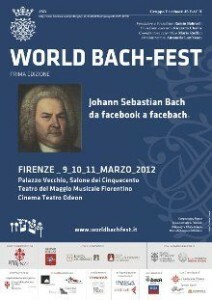 An event organized on Facebook, by the iniziative of the group “Friend of Johann Sebastian Bach”, created by Mario Ruffini and wanted by Ramin Bahrami, and so is born the first World Bach Fest that will take place in Florence from 9th to 11th march 2012. From Teatro del Maggio Musicale Fiorentino, to Salone dei Cinquecento at Palazzo Vecchio, to Cinema Teatro Odeon, the notes of Bach will resound for three exciting days. The festival, sponsored by the city of Florence and by the Tuscany region, will be opened at the Teatro del Maggio Musicale Fiorentino with three concerts conducted by Mario Ruffini and interpreted by one of the greatest performers of Bach: Ramin Bahrami, who will be the protagonist along this three days of non-stop music. Inside the Salone dei Cinquecento will can attend to 48 hours of non-stop music where will play soloists, groups and orchestras that will resound through all Florence. In addition to the musical event, at the Cinema Teatro Odeon will be screened some short films dedicated to Bach and selected by a jury and, among these, the winner will be screened in the closing night of the World Bach Fest, Sunday afternoon 11th march 2012. Then there will a season of films dedicated to the German genius (in original version with English subtitles). All the initiatives will be free entry. For more information about the program of the event visit the official site of World Bach Fest. For lovers of Bach of all over the world who want to attend the first world event dedicated to Bah, the Ars Hotels chain offer you its hotels. Book now a room!